El Salvador is a country that doesn’t see much in the way of tourism, which is a shame considering how fantastic El Salvador is. Often overshadowed by Central America’s more popular countries like Guatemala and Costa Rica, tiny El Salvador is often missed out by travellers backpacking in the region. However, with its colonial towns, friendly locals and diverse scenery, El Salvador is a must visit destination in Central America in its own right. Here are three places that you won’t want to miss. A line of palm trees is that separates the sleepy streets of El Tunco’s town from the sandy beach. This quiet town is made up of just a couple of streets and is predominately a surfing town due to its great waves. The small amount of tourism that it gets means that the town has it’s fair few cafes, restaurants and hostels, however, it remains largely untouched. 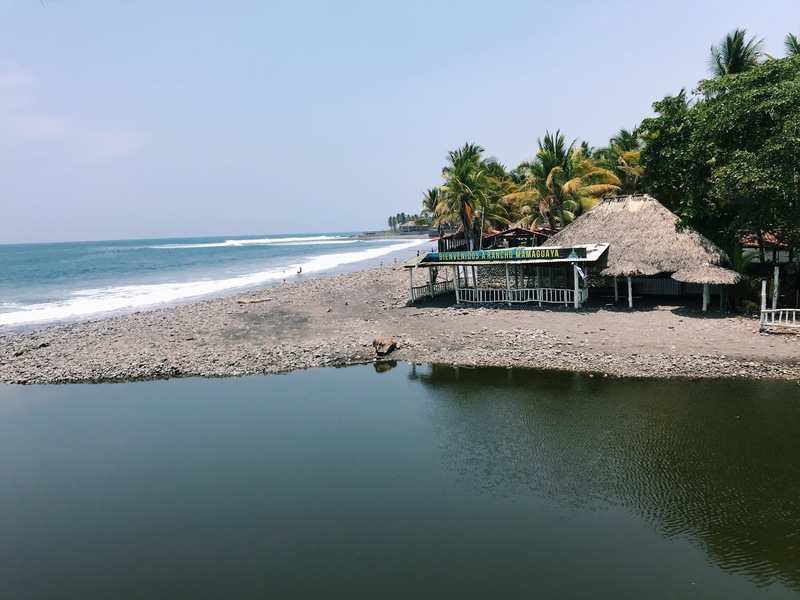 El Salvadoran’s are some of the friendliest people in Central America and I guarantee you you’ll feel right at home in this chilled beachside town. If you’ve never surfed before then you can give the sport a go at one of the surf schools or simply spend the day relaxing at the beach. When it comes to eating, you have to try Pupusas: an El Salvadoran speciality. These hand-made flatbread are stuffed with anything from black beans to pork and cheese and are then baked on a hot grill. They are then served with sides such as cabbage slaw and tomato relish that you can help yourself to from the table. The best place to get these is at local pupuserias: bustling eateries, packed with local families grabbing a quick dinner. Pupusas only cost a dollar each and are freshly made upon order so it’s best to start with one and take it from there. You have to stop by Tunco Bonita in El Tunco for the best pupusas around. Sleepy Suchitoto is a fascinating colonial town in El Salvador. The colourful Spanish architecture and winding cobblestone street in this town give Central America’s more famous destinations such as Antigua, Guatemala and Granada in Nicaragua, a run for their money. The town really is a photographer’s paradise and with so many winding roads and hidden courtyards to explore, it really is a delight to walk around. While it is largely untouched, Suchitoto experiences a small amount of tourism, mainly due to tour groups so there are a few international style cafes where you can pick up a nice coffee and some brunch food. One place you have to visit is Cafe 1800. This stunning outdoors cafe has unbeatable views over the lake below and is honestly one of the most stunning places I have ever had my coffee fix. For a tiny country, El Salvador packs in a large number of stunning waterfalls. Some of the most impressive ones are the Tamanique waterfalls which you can easily do on a day trip from El Tunco. The ones located just outside of the town Juayua also looked fantastic but sadly I didn’t get around to visiting these on my Central America tour. Alexandra has some amazing photos and waterfall suggestions for El Salvador in her blog though. One of the most common questions that I get asked about my travels in Central America is, was it safe? While there are some problems with gangs and political demonstrations in the region, it generally felt very safe and I never felt uncomfortable throughout my one-month backpacking. If you are anxious then I would highly recommend doing Central America on a group tour, like I did with G Adventures. This was great because I got to travel with a fantastic group of people and we had the advantage of travelling with a tour guide who knew the area. You can read my review of my Central America tour here.